Lloyd Lindbergh "Lindy" Delapenha was the first Jamaican to play professional football in England joining Portsmouth April 1948. He was transferred to Middlesbroug in April 1950 and became a sensation playing on the wing or inside forward. 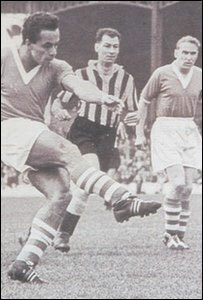 Lindy became Boro's leading scorer in the 1951-52, 1953-54 and 1955-56 seasons and scored a total 93 league and FA Cup goals in 270 appearances. Delaphena moved on to Mansfield Town in June 1958, making 115 appearances and scoring 27 goals over two years. He retired from League football in 1960 and returned to Jamaica where he became director of sports at the Jamaica Broadcasting Corporation. 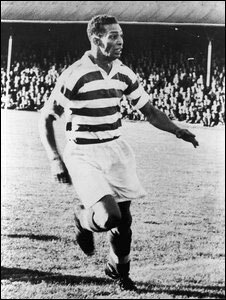 Jamaican born Gil Heron was Celtic's first black player. Heron was known as the Black Arrow, played in the United States before joining the Scottish outfit Celtic in 1951. He made his debut on August 18, 1951 in a League Cup tie against Morton at Celtic Park scoring one of the two goals in the Celtic victory. He made five appearances for Celtic before eventually returning to the USA. Heron was the father of the jazz musician and composer, Gil Scott-Heron, who received much critical acclaim for one of his most well-known songs The Revolution Will Not Be Televised. Other songs included the hit "The Bottle" and "Angel Dust". The Black Arrow died in a nursing home in Detroit on Nov 27, 2008 at the age of 87. Theodore “Tappa” Whitmore was born in Montego Bay, Jamaica on the 5 August 1972. He played for local clubs Violet kickers and Seba United and debuted for the Jamaican national team in November 1993 in a friendly match against the United States. Known as a midfield general, for his creative, silky smooth plays, Whitmore became a catalyst of Jamaica’s 1998 Reggae Boyz World Cup qualifying team. He became an international sensation for his World Cup performance scoring two goals in Jamaica's 2-1 victory against Japan. He is currently the only Jamaican to score goals in the World Cup while wearing the Jamaican colors. 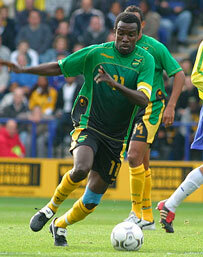 This Caribbean football legend also earned the title of Caribbean Footballer of the Year in 1998. Whitmore went on to play in the English league, where he represented Hull City and then Scottish outfit Livingston before signing with Tranmere Rovers in 2004 before retiring from International football. As a part of the restructuring of Jamaica’s national football, Whitmore was appointed as the head coach of the Reggae Boyz in 2009. In December 2010, Whitmore coached Jamaica to the 2010 Digicel Cup title, making them the number one team in the Caribbean. John Charles Bryan Barnes MBE was born on 7 November 1963 in Kingston, Jamaica and played there at the high school level. Jonn Barnes moved from Jamaica at the age of fifteen to Watford, England where hi spotted playing at local park and then brought to the attention of Watford Football club. Predominantly a winger Barnes could be used infield to good advantage and he was capable of destroying defences on his own. Many of his goals were spectacular shots or stunning individual efforts. His remarkable mixture of raw power and ball artistry was enough to trouble the countries finest defenders and his goalscoring record proved him a more than capable finisher. This was all natural talent as well. Barnes was not the product of coaching or any youth system, he was just a young man with special gifts expressing himself on the football field. Barnes went on to make a big an impact on English football. He went on to become one of the highest profile black footballer ever to grace the English game was capped 79 times for England. Barnes also helped Liverpool to re-establish themselves as the countries top side and many fans would argue that his years there became Liverpool's best ever. 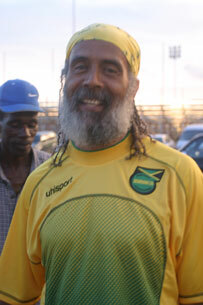 Alan “Skill” Cole is a Jamaican folk hero whose football feats were legendary. Alan Cole was raised in central Kingston in the working-class neighborhood of Woodford Park. In 1962, Cole went to Kingston College, then a powerhouse in schoolboy football, before moving on to Campion College in 1964. He then entered Vere Technical in 1965 where he made his schoolboy debut and an immediate impact in the daCosta Cup competition scoring 38 goals and becoming the leading goal scorer. Cole became the youngest player to represent Jamaica’s senior team at the age of 15 years old making his debut against a Brazilian team. Cole was a midfield maestro and local fans compared to the master Pele. His extremely good vision and excellent passing of the ball has put him in the category of “One of Jamaica's best ever players”. Cole had short professional stints in the United States with the Atlanta Chiefs in the late 1960s and then with Brazilian club Nautica in the early 1970s. Unfortunately his international career never lived up to expectations and he returned home to become the road manager for his friend Bob Marley in the 1970s. Cole, a Rastafarian spent three years in Ethiopia where he coached the national team. In September 2010, Alan 'Skill' Cole was presented with a plaque by FIFA President Sepp Blatter in recognition of his contribution to Jamaican football.